Citation: C N Trueman "Britain and Rocket Technology"
historylearningsite.co.uk. The History Learning Site, 26 May 2015. 7 Apr 2019. Rocket development in Great Britain before 1939 was actually far greater than might have been expected given the conservatism that could be found in all sections of the military. The Americans sent over teams to learn about British rocket technology, such was its reputation. By late-1940, a 3-inch rocket was brought into service. 128 of these small rockets could be fired from what was called a ‘projector’. In May 1940, it had already been decided that these rockets should be used against German aircraft. The firm G A Harbey in Greenwich was given the task of mass-producing these rockets and by September 1940, over 1,000 had been made. In October 1940, a rocket battery was formed led by Major Duncan Sandys to defend Cardiff using the three-inch rockets. On April 7th, 1941, the first German plane was downed by one of these rockets. By the end of April two rocket batteries defended the Welsh city. The batteries were known as ‘Z’ batteries – pictured above. Eventually, the ‘UP-3’ was linked up with radar and equipment that predicted the flight path of planes. When it exploded, the rocket had a lethal radius of 70 feet. The ‘UP-3’ was also increased in size to enable a larger warhead to be carried. By December 1942, 91 Z batteries existed in the UK. 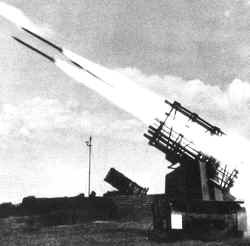 Britain also developed air-to-surface missiles. These were a modification of the ‘UP-3’ and were nearly 6 feet in length and capable of nearly 1,000 mph. By 1942, they were being used operationally in the Royal Navy where they were primarily used against submarines. The army turned down the idea of having them as the army’s senior commanders deemed them ‘superfluous’ to requirements. The Royal Navy continued with the development of the ‘UP-3’ and came up with the ‘Mattress’ system, which was used in amphibious landings. The ‘Mattress’ system was used to devastating effect in the landings in Sicily and mainland Italy. It was this success in the ‘soft underbelly’ of Western Europe that persuaded the army to adopt ‘UP-3’ and an army version was used when the British and Canadian armies crossed the River Rhine. Towards the end of the war the ‘Stooge’ was developed by the British. It was designed to attack planes, particularly Japanese kamikazes. The ‘Stooge’ was a radio-guided missile with a range of 8 to 9 miles. It reached a top speed of 500 mph and carried a 220lb warhead.